The Azimut|Benetti Group has chosen Puglia for its eleventh exclusive Yachting Gala, where the communities surrounding the two brands comes together every year. The region National Geographic called the most beautiful in the world was selected as the location for this prestigious event, attended primarily by yacht owners from all around the world, with the aim of offering all the guests an exceptional experience made unique by the colours, flavours and the sparkling atmosphere of this area. The exclusive international parterre took part to a rich programme of events, starting with a cocktail reception in the splendid halls of Monopoli’s Castello Carlo V and a private viewing of the exhibition of artworks by Joan Mirò. Over the weekend of 23-24 June, the spectacular waters off Monopoli hosted a parade of yachts from the Group’s fleet, including the new Azimut S6, which will make its official debut in September at the Cannes Yachting Festival. Overlooking the bay, this year’s Azimut|Benetti Village staged entertainments of all kinds: sea trials, seabob racing, a gaming hall offering roulette and blackjack, exhibitions of jewellery and clothing from the most prestigious Italian designers, live shows by master tailors and signature shoemakers, and much more. One of the main attraction was the lunch time with a true feast of flavours, with all the finest local specialities. And the guests also had the chance to discover Monopoli’s secrets and admire the reefs of Polignano a Mare. Thanks to Pugliapromozione, the local tourism organisation, which the Group selected as destination partner, guests saw the photos of the event posted on their Instagram feed transformed in real pictures in the style of an old Polaroid print, thus blending analogue and digital; they also wrote and sent real postcards of local landscapes to recapture the feeling of communicating in a non-instant, but this very reason, more thoughtful and precious way. The piazza and atmospheric narrow streets of Borgo Egnazia were the setting for the gala dinner on Saturday. This magnificent resort, a favourite destination of the international jet set, hosted an extraordinary gastronomic experience culminating in the Festa del Borgo – an exciting tribute to the region’s festivals that transformed the main square into a theatre of folk music and dance that engaged and involved everyone present. To round things off, digital effects, spectacular pyrotechnics, and international star DJ sets for the late-night revellers amongst the cosmopolitan nautical elite. Doing the honours were Paolo and Giovanna Vitelli, respectively Founder-President and Vice President of the Azimut|Benetti Group. It is therefore confirmed the importance of this event that, year after year, strengthens the bonds between the Group and its customers, thanks to a proven formula that also remains fresh with new experiences and surprises every time. Azimut Grande 35 Metri won the prestigious "Best of the Best" awarded each year by Robb Report, one of the most influential magazines in the luxury industry. The yacht’s key features won universal high praise, from the spacious and versatile outdoor spaces designed by Stefano Righini, to Achille Salvagni's interior design. She keeps on surprising, amazing and, above all, winning. Azimut Grande 35 Metri, the shipyard's flagship, is winning the hearts of juries at all the most renowned international awards and has now received her sixth prize since the beginning of the season. The jury of the US edition of Robb Report, the well-known magazine that represents an authority in the luxury sector, has chosen the "Queen of the Grande Collection" as the best motoryacht in the category between 100 and 200 feet. The atmosphere was intense but spirits were high at the 6th Barracuda Tour, which took over the Port du Crouesty, in Brittany, France, from 25 May to 2 June. For a few days, the sea around the Quiberon Bay was the theatre for the best no-kill fishing competition in Europe, and everyone among the 600 international contenders – 150 teams – agrees that the event is of international standard. Winners for the first time, the ATM Communication team (Côtes d’Armor) came first in the Grande Final ahead of Chantereyne (Beneteau Cherbourg) and Sun Way (trailers). Yannick Hemet, Beneteau’s sales director for south Europe, the organizer of the event, is extremely satisfied with the wonderful result. Beneteau America is pleased to announce David Aldrich as the new Outboard Sales Manager. In his new role, David will be developing and managing the outboard sales of Beneteau America, with a specific focus on the dealerships development and boat club. David holds 20 years of experience in the North American Marine Industry building distribution networks, with specific focus on sales programs, national dealer development, and product expertise. Recently working with Freedom Boat Club building their North American footprint to encompass most of North America. “David brings such a strong experience to us, his past years as Regional Sales Manager at Brunswick Boat Group, Bombardier, Chis Craft, and Regal Marine, will be a tremendous support to develop our outboard range in USA, as well as the Beneteau Boat club”, says Luca Brancaleon, Managing Director of Beneteau. For the past three years, his latest role was at Freedom Boat Club as Director of Franchise/Marina Development in North America. “Outboard boats represent 60% of the total number of boats Beneteau produces each year. It is a major opportunity for Beneteau in the US. We are excited to have David joining the team. He is going to use his huge experience in the industry to develop this business unit” says Jean-Francois Lair, Director of Sales for Beneteau Americas. Bering 65 Serge launched in 2015, this year made a record non-refueling crossing of 4,200 nautical miles from Thailand to Vladivostok in 27 days. All the way the vessel towed a 9 meter Hysucat sea boat with a displacement of 3,500 liters including full fuel tanks. The total fuel consumption was 12 300 liters burning 2.9 liters per mile and passing 155 miles per day at a speed of 6.5 knots. The Bering 65 is a rugged and classical looking steel yacht capable of any ocean crossing. She is quite, strong and leaves a graceful wake underway. Her displacement is over 235,000 pounds (106 tons) and with 4,500 gallons (17,000 liters) of fuel you can easily cruise for thousands of miles burning a combined 8 gallons (30 liters) an hour at 8 knots. 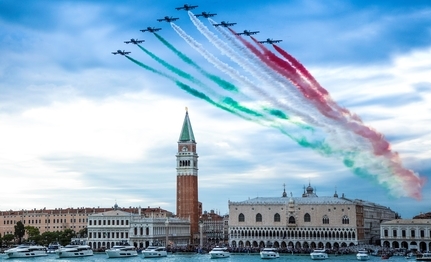 For three wonderful days the Ferretti Yachts 50th anniversary seduced Venice, coloring the sky with the Frecce Tricolori acrobatics and enlivening streets and canals with fabulous boats and unique and extraordinary events. The special anniversary involved Ferretti Yachts owners from all over the world in three days of celebration of art, entertainment and Italian culture, in the evocative setting of the city on the water. The absolute protagonist was the Italian beauty in all its forms, from the design of the boats to the artistic and architectural masterpieces that make Venice an open-air museum. The celebrations started on Friday with a gala dinner at Palazzo Ducale, in front of the evocative "Paradise" of Tintoretto, the largest canvas in the world, and the magnificent "Triumph of Venice crowned by the victory" of Veronese. From the ogival windows of Palazzo Ducale, guests attended the Ferretti Yachts fleet parade. At twilight, eyes were focused on the acrobatics of the Pattuglia Acrobatica Nazionale, Frecce Tricolori, in the anniversary of the "Battle of the Solstice", when exactly 100 years ago, in June 1918, the Italian Army heroically resisted the last Austro-Hungarian offensive and during which Major Francesco Baracca, “Asso degli Assi” of the Italian Aviation lost his life. Saturday started with the opening the Arsenal of Venice doors, exceptionally granted for the occasion by the Italian Navy, where 11 wonderful yachts from 45 to 96 feet - including the new world premiere Ferretti Yachts 670 - moored inside the Darsena Nuovissima, were offered to the eye of the city. The Arsenal was also the setting for the second evening, with a refined dinner made by Cipriani and with the exclusive performance of the great Italian singer Umberto Tozzi. Gulf Craft has appointed Gregory Yeakle to be their new Chief Executive Officer. One of the world’s largest luxury ship builders, Gulf Craft is based in the United Arab Emirates. The group has grown into a leading global business over the course of the past 37 years. He succeeds Erwin Bamps who held the position for the past 4 years and has now moved on to a new role as advisor to the board for international matters. Gregory Yeakle joins Gulf Craft as CEO with a solid record of leadership having generated strong growth in companies such as Informix, Alexander Proudfoot Company and Invensys. He has worked globally in C-level positions successfully for over two decades in both business development and operations around the world. More recently he was Global Head of the Oil and Gas division of Accudyne Industries, where he was equally Managing Director of Milton Roy and Dosatron amongst others. Before joining Gulf Craft, Gregory Yeakle was the head of Operations for Cornerstone Management Consulting where he and his team worked with the Gulf Craft group. According to the group’s Chairman, Mohammed Al Shaali, “This experience has helped to ensure a smooth leadership transition.” Mr. Yeakle states that, “These are challenging yet exciting times for the industry. Innovation and technology are combining to provide amazing new products and services possible for Gulf Craft. As a lifelong boating enthusiast, I am delighted to have the opportunity lead Gulf Craft into the next phase of its global expansion”. The internationally renowned yacht and boat builder has seen phenomenal growth with new models launched annually. The company is continuously exploring opportunities to venture into new markets and is planning to expand even further in the coming years. With the build of the company’s first mega yacht well under way, the next chapter in the Gulf Craft story is sure to keep followers engaged. Hatteras Yachts a world leader in the construction of convertible sportfishing and luxury motor yachts from 45 to 105 feet, announces the launch of the inaugural Hatteras Cup, an elite fishing tournament beginning today that is open exclusively to participants fishing on a Hatteras sportfish. At stake is $1.15 million in potential prizes. “At Hatteras, we want to feed the passion we share with our sportfishing customers for going after big game offshore. The Hatteras Cup is an opportunity for the brand that started it all to recognize the passionate anglers who fuel us – Hatteras owners,” said Hatteras Yachts President and CEO Kelly Grindle. “Our boats are built to break both waves and world records.” “While there are many highly competitive teams fishing on Hatteras sportfish boats in tournaments around the world today, we wanted to give Hatteras owners and their teams a chance to compete against each other for big prize money,” said Joe Cacopardo, Hatteras Yachts director of marketing. “Hatteras Cup winners are going to have serious bragging rights.” The $1 million prize category, for the registered team that catches the Heaviest IGFA-Verified World Record Atlantic Blue Marlin from a Hatteras sportfish, ends on December 31, 2018. Competition for a total of $115,000 in purses for the Heaviest Blue (non-world record), Catch and Release and Game Fish Divisions ends on January 31st, 2019. Special Recognition Awards also will be presented to the top Lady Angler and Jr. Angler. The awards will be presented during the 2019 Miami Yacht Show. The Contest Rules for the 2018/2019 Hatteras Cup are as follows: All participants must register on the Hatteras Cup website at at least 24 hours prior to submitting any catch, regardless of Division. All fish submitted for prize consideration must be caught while the angler is fishing on board a Hatteras yacht of any year or model with a verifiable HIN number. No other brand of boat is eligible for the Hatteras Cup. Entrants must submit images (video and/or still) of each fishing day including action shots of fishing, weigh-in (where applicable), Captain, crew, anglers, and boat. There are three Divisions and each has its own unique set of rules beyond the Contest Rules stated above. The Big Rock Blue Marlin Tournament is known for non-stop action, and the 60th year of this iconic tournament did not disappoint. Rough conditions and slow fishing early in the week dictated lay days for many of the 183 teams fishing the 6-day tournament. One or two blue marlin were weighed the first few days, but no one could predict how wild the final day would be at the scales! aturday is commonly a quieter day for the tournament as most teams are typically excited to get out there early in the week. But the 2018 tournament saw 122 boats out of 183 fishing the final day. Hook-ups and releases were numerous. Only 3 hours after ‘Lines In’ was called by Randy Ramsey, the first blue marlin was boated. Then another, and another, and another. By 1 pm it was reported that 6 blue marlins had been boated and the first would be arriving at Big Rock Landing shortly. Jarrett Bay hull 40, Fender Bender called in their ‘Hook Up’ at 1:48 pm, just 12 minutes before the 2pm ‘Lines Out.’ Meanwhile, back at Big Rock Landing, the leaderboard was being re-evaluated as fish were being brought to the scales one after another. Then at 3pm, the call came in over the radio that thousands of listeners had been anticipating. Fender Bender had boated their fish and was headed to the scales. This was the seventh and last blue marlin boated and weighed on the final day of the tournament. Fender Bender backed into the scales and the tournament crew went to work measuring the length of the fish and prepping it for hoisting from the cockpit. Silence from the crowd was followed by an outburst of cheers and applause as the weigh-master reported ‘514.3 pounds’. This blue marlin catapulted the Fender Bender team to second place in the tournament with a $262,450 cash prize. 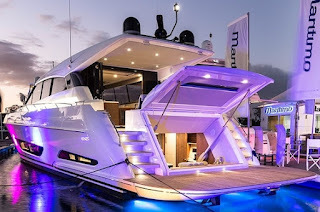 The recent highly successful world premiere of a totally new concept in luxury sport yacht design, the new Maritimo X60, has prompted a series of mini boat shows to highlight the vessel stretching from the Gold Coast to Sydney. The vessel has won international acclaim generating world wide interest and sales since its launch at the 30th Annual Sanctuary Cove International Boat Show last month and forward orders now exceed one dozen. The premiere at Sanctuary Cove International Boat Show marked the first of many displays of the X 60 and X- Series throughout 2018, including further appearances at exhibitions in Australia, New Zealand and the United States. Luxury motor yacht manufacturer, Maritimo, is now set to hit the high seas with boat shows all along the east coast between the Gold Coast and Sydney before the vessel is featured at the Sydney International Boat Show in August. On Friday 8th June, 2018, Princess Yachts in partnership with the Marine Conservation Society, Seabob and UK National Freediver Champion Georgina Miller, attempted to achieve the greatest distance travelled underwater in a single breath using a diver propulsion vehicle in open water. After several attempts Georgina achieved a distance of 137m in a single breath while utilising a Seabob. Unfortunately, due to adverse sea conditions near the Eddystone Reef, Plymouth UK, 12 miles from the home of Princess Yachts, a record was not set at this time. This campaign taking place on World Oceans day did however generate huge awareness around the continued conservation work on the reef through Princess Yachts' social media channels which were taken over by Oceanographic Magazine. If you missed the live coverage of this unique event, we have captured exclusive behind the scenes footage which will be shared online. The attempt involved a huge amount of crew and although the target distance was not reached this time, hopefully the whole team can reunite soon to accomplish the world record. Sanlorenzo, among the leading shipyards in the world in the production of yachts and superyachts, will participate in the sixth edition of SeaFuture, an important event dedicated to the Blue Economy, as a gold sponsor. SeaFuture, which will take place at the Naval Base of La Spezia from June 19 to 23, 2018, is being organized by IBG (Italian Blue Growth, a company formed by the Ligurian District of Marine Technologies, the Tecnomar Liguria Consortium and EIEAD) together with AIAD, the Liguria Region, Blue Hub (a Special Company of the Chamber of Commerce of the Ligurian Rivieras), and in collaboration with the Italian Navy. The program includes the participation of more than 50 delegations coming from around the world and will offer an intense schedule of workshops and talks that have the sea as their main theme with the goal of supporting “Blue Growth”, a strategy for the promotion and development of a sustainable business model as recommended by the European Community that combines industry, science, technology and care for the environment and which is directed at those who work in close contact with the sea. In addition to its participation as sponsor, Sanlorenzo has selected the occasion of SeaFuture to exhibitthe SD112 Aventus yacht with its unmistakable “1930s ocean liner touch” in the dock area set among the historic buildings of the Arsenale della Marina and majestically moored next to the historic Amerigo Vespucci school ship. Sanlorenzo, one of the main players in the Blue Economy since 1958, will participate in SeaFuture 2018, once again confirming its commitment and the attention which it has always focused on the sea, an important resource which is to be protected and preserved. It has opened yesterday to the public Art Basel in Basel 2018, the leading art fair for modern and contemporary art, which Sanlorenzo has attended as a partner, confirming its relation with the art world. An actual excellence in the world of boating, over the years Sanlorenzo has emerged thanks to its innovative approach, overcoming conventions and taking unexplored pathways: with dedication, courage and an entrepreneurial attitude Massimo Perotti, Chairmain and CEO of Sanlorenzo, has led the company to open itself to different realities which, however, speak similar languages like art and design, so to suggest a different way to experience sea life, leaving crystallised habits behind. On a consistent, transversal pathway which has brought it closer and closer to the world of art, during the year of its 60th anniversary Sanlorenzo has chosen the Art Basel show in Basel to tell the international audience about itself through the impressive installation set up at the Collectors Lounge, signed by Piero Lissoni, the company’s new art director, who pays tribute to Emilio Isgrò, one of the best-known contemporary Italian artists. An ethereal, suspended space whose perimeter is marked by Isgrò’s “erasures” reproduced on its walls. A sea made up of lines, signs, words through which the models of Sanlorenzo’s superyachts, displayed inside glass cases, seem to sail around the work “I viaggi della mente” (“The travels of the mind”) by Emilio Isgrò, which is exhibited at the centre of the installation. “Ulysses, the Greek hero from the Odyssey, is an explorer who sets out to discover the world with his own boat and his crew, as well as a traveller who longs for knowledge. His desire to learn and understand leads him to unknown destinations. Emilio Isgrò’s Odyssey also recounts a discovery, the revelation of a hidden meaning behind the words erased by the poem. The artist takes a cultural journey, a pathway capable of lighting up by contrasts and to bring new light, new meanings to Homer’s verses. Because each traveller is a contemporary Ulysses who reflects on the world and wants to discover it. Likewise, each journey is a discovery of places, people, cultures: a wonderful journey which begins from one’s mind and continues at sea.” I viaggi della mente - Omaggio a Emilio Isgró (The travels of the mind – A tribute to Emilio Isgró”). Piero Lissoni describes the natural connection between Sanlorenzo and art, honouring Emilio isgrò inside a wunderkammer, created with an iperminimalistic approach which is typical of Lissoni’s style, highlighting the company’s experience, artisanship and innovation, embodied by different superyacht models. Britain’s biggest boat builder, Sunseeker International, welcomed HRH The Earl of Wessex last week to its manufacturing facilities in Poole. During his visit, The Earl helped the company to recognize a sales milestone for its 76 Yacht, a model which launched at the Southampton Boat Show in September last year. The 76 Yacht delivers unprecedented levels of luxury, sociability and entertaining space and, with 35 yachts sold, is in high demand. The 76 Yacht certainly hits the sweet spot in terms of size, space and superyacht feel whilst being extremely manageable for those looking to self-crew. Clever design maximises social and entertaining spaces, whilst the innovative use of glass enhances natural light, making this a bright and airy boat in which to relax and unwind with family and friends. A fleet of 91 boats departed Sandestin, Florida, last Thursday in search of a big blue marlin. When the scales opened Saturday afternoon, the first boat in was a team of high school buddies with the winning fish. Angler Will Beard boated the 699.2-pound blue after a two-hour fight, which also gave Will the title of Top Overall Angler. Owner Doug Terreson owns Can't Deny It, a Viking 48, and agreed to loan the boat to the group of recently graduated 18-year-olds as long as the gang paid the entry fee. Reel Fire, Chris Ferrara's Viking 70, hooked up Saturday morning and was a late arrival to the scales but still claimed 2nd Place Blue Marlin with a 665.2-pound fish. Captain Chris Blanchet put Connor Ferrara on the blue near Louisiana. They hightailed it back to the scale with 45 minutes to spare.Top Release Team and Crew went to owner/angler Dana Foster and his Viking 72 Born2Run with four blue marlin. Led by Captain Myles Colley, Dana also claimed Top Angler for releasing all four fish. Past Emerald Coast champ Done Deal, a Viking 70 owned by Jon Gonsoulin and run by Captain Jason Buck, narrowly missed setting a new tuna tournament record. Jon's daughter Katie brought the winning 190.2-pound yellowfin to the weigh station, a half-pound shy of the all-time mark. Katie also released two blues, good for 3rd Place in the Release Team Division based on time. Emeril Lagasse's Viking 70, Aldente, claimed 2nd Place Tuna with a 168-pounder and 2nd Place Crew with Captain Brad Benton at the helm. Captain BJ Teems, on the Viking 61 Soggy Dollar, put his team on the 3rd Place Dolphin weighing in at 39.1 pounds. Viking claimed the four heaviest blue marlin at the recent Cajun Canyons Billfish Classic among the 46-boat fleet. Will Wilson's Viking 66 Wynsong took the top spot with a 699.3-pound fish. Captain Allen Staples put angler Zach Tokheim on the 117-inch big blue. Rocky Jones' Viking 56 Reel Addiction was 2nd weighing in at 545 pounds and A Work of Art, Art Favre's Viking 92, took 3rd with a blue recording 521.3 pounds. Rounding out the scoreboard was Mitch Jurisitch's Viking 68 Second Wind with a fish at 488.9 pounds. Wynsong also claimed 2nd place Release Boat, 2nd Place Billfish Points and landed the top dolphin at 156.4 pounds. Crawgator, a Viking 61, had the 2nd Place Wahoo with JD Dugas' 32.6-pounder and Mike Butler's 3rd Place 'Hoo weighing in at 28.7 pounds. The Viking 52 Snafu had the 2nd Place Dolphin with Bart Barre's 39.7-pounder and the Viking 64, Larry Wireman's Carib, was 3rd with a 38-pound dolphin. Katie Gonsoulin on her dad'sViking 70 Done Deal released a pair of blues to take 3rd Place Billfish Angler on time. The Cajun Canyons is the 2nd of the five-series Gulf Coast Triple Crown. 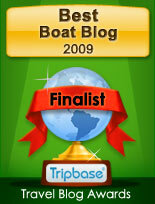 Currently the top boat is Wynsong with Done Deal in 2nd followed by the 68 Breathe Easy and in 4th is Reel Addiction. Way to go Miss Victoria! With Captain Brian Speedy at the helm of this Viking 76,Miss Victoria won the three-leg Abaco Diamond Series in the Bahamas. Taking a strong lead at the first event, the White Marlin Roundup, the crew released one blue marlin, nine white marlin and a pair of sails as well as taking two big whites to the scales. This serious action allowed the team to pull away from the pack early on. The crew added another two blue marlin, four whites and a sailfish to their tally between the Production vs. Custom Shootout and Abaco Beach Blue Marlin Tournament to ultimately win the Grand Championship title for the Series. The Viking 62 Free Spool released a white marlin at the Roundup then turned around and won The Shootout with six blues. Free Spool claimed 3rd Place overall in the Series. Reel Addiction, Rocky Jones' Viking 56, weighed in the winning blue marlin at the prestigious Mississippi Gulf Coast Billfish Classic. Captain Scooter Porto put angler Chase Pate on the fish on the final day of fishing about 165 miles offshore in the Gulf. Chase reeled in the behemoth that registered 796.9 pounds at the scale. "We got one bite all weekend, and that was it," said Chase. Second Place Blue Marlin was caught by 17-year-old angler Alex Krake on the Viking 76 Team Supreme. Alex's fish weighed 739 pounds. Pearl, a Viking 48, claimed 3rd place with Edgar McKee bringing a 611-pound blue to the weigh station in Biloxi. Jon Gonsoulin's Viking 70 Done Deal claimed 2nd Place Release Boat based on time. The Viking 52 Deadline took 2nd Place Dolphin with a 45.2-pound fish, and theViking 70 Quicktime was right behind them in 3rd with a 44.6-pounder. Third Place Swordfish went to the Viking 64 Titan Up. Done Deal, Jon Gonsoulin's Viking 70, was the only boat to weigh in a blue marlin on Friday night to claim the early tournament lead that eventually clinched 1st Place Blue Marlin. Angler Katie Gonsoulin's 118.5-inch blue topped the scales at 740.6 pounds. "I was hoping that fish would maybe hit 700 pounds," said Done Deal Captain Jason Buck. "We knew it was a fat fish, but we were happily surprised when the number posted!" That is the largest fish caught by the 21-year-old highly-accomplished lady angler. Breathe Easy, Matt McDonald's Viking 68, claimed 2nd Place Blue Marlin. Captain Pat Ivie put angler Rick Olsen on a 111.5-inch fish that weighed in at 551.8 pounds. In the Catch and Release Division, Share-E, a Viking 72, released three blue marlin for 2nd Place while the Viking 76 Team Supreme took 3rd place. A huge wahoo brought big cheers from the crowd as the crew on the Viking 66 Wynsong hung up a 110.4-pound fish that topped the nearest competitor by 76 pounds! Lyon's Pride, a Viking 62, took 2nd Place with a 34.4-pound 'hoo. Share-E added to their prize money with a 3rd place finish in the Dolphin category at 32 pounds and Top Lady Angler was awarded to teammate Sherry Polk. For the second year in a row, the 22nd Annual Orange Beach Billfish Classic saw record participation and prize money. Fifty-three boats released 25 blue marlin, six white marlin and one sailfish while weighing in five blues. The OBBC is the first big game fishing tournament of the season along the Gulf Coast and also the first leg of the Gulf Coast Triple Crown Championship. Free Spool, a Viking 62, won the 2nd leg of the Abaco Diamond Series in the Bahamas. Angler Jarret Yavorski started the team off with a blue release on Day One and added another on Day Three. Rob Rowe added three blues to the tally and Matt Lohti added one as well. The Viking 64 Black Hawk weighed the top Mahi at 57.8 pounds. This puts Miss Victoria, a Viking 76, in 1st Place and Free Spool in 2nd for the Abaco Diamond Series overall championship. If you believe in the power of numbers, there's no doubt that the Viking 62 Convertible ranks as one of the most successful modern sportfishing boats of all time. Viking just began construction of the 60th hull, a testament to this model's tremendous popularity and dominance of this segment of the market. Paul Mann has started its construction for Hull number 140, what is a 63 feet sportfish yacht to be build in the Jig method. Paul Mann 63 Hull 140 will feature a three cabin two head interior with sleeping accommodation for eight persons. 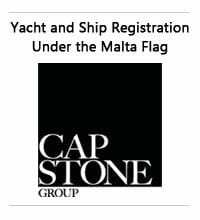 Owners cabin is located at midships to starboard and will feature a forward located ensuite shower head. 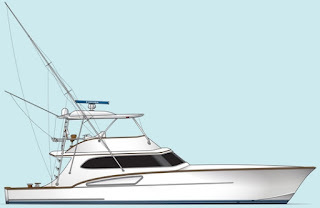 Living is a traditional sportfish layout with saloon on entrance, and galley and dinette forward. Paul Mann 63 Hull 140 will be powered by twin Cats 1600hp engines. Launched during the 2018 Sanctuary Cove International Boat Show, the new Maritimo X60 marks the first of many displays of the highly anticipated first X-Series model throughout 2018, which will include further appearances at exhibitions in Australia, New Zealand and the United States. Development has also commenced on the next model within the X-Series Range, a Maritimo X50 which the company is closely guarding until its introduction at Sydney International Boat Show with its world premiere scheduled for 2019. Integral in the X-Series and what differentiates to the S-series is the versatile aft cabin space that enables high levels of custom-ability for owners to cater to the space to their specific requirements. Inherent in the X60, the space enables an additional cabin accessible from saloon and swim platform, that can be arranged as beach club, additional stateroom, tender garage, euro galley and other custom options. Maritimo lead designer, Tom Barry-Cotter said the X60 was one of the most versatile sports motor yachts available in the international market, with multiple arrangement options of the aft cabin, and regency suite. With units already in production, bound for new homes in Australia, New Zealand, North America, and Europe, he credits the early momentum in sales to the value added into the design’s increased accommodation spaces to that of its competitors. Inherent in the X-Series bloodline will be the company’s race driven performance prowess. With a complete new efficient shaft-driven hull and drive-line design, the X60 has been tested at speeds up to 34 knots with 925hp Scania power, with excess speed capability available with Volvo 1000hp power option. Hull efficiency within the cruising speed range was a major focus of the hull and driveline design. The X60’s class leading range and economy has been recorded at over 30 knot cruise and consumption rate of 200 liters per hour at a 27 knot cruise. With superior economy and greater fuel capacity than direct competitors, the X60’s range capabilities are revolutionary within the sport motor yacht segment. The new era variable deadrise hull design with deep-V bow entry, also offers a soft dry ride, whilst weight distribution within the hull design allows for effortless transition to plane and running attitude through the power range. Maritimo has also worked closely with Twin Disc in the development of marina maneuvering EJS joystick systems. The latest Twin Disc system has the most sensitive joystick docking ability in the industry, enabling stress free docking in tight spaces. The X60 is fitted with Twin Disk Quickshift transmissions, EC 300 Electronic Control System, Express Joystick and has the option of being fitted with Express Positioning System technology which enables precise and continuous position and heading hold. Botnia Targa presents the project for a third generation Targa 27, the Targa 27.2. The first version, simply Targa 27, which saw the light of day in 1991 has since its very beginning been the main pillar in the Targa range. After eleven years and 200 boats built the second generation, Targa 27.1, was launched. And now, after 400 built 27.1, it's time for the Targa 27.2 to take over. As always Botnia is true to its idea. 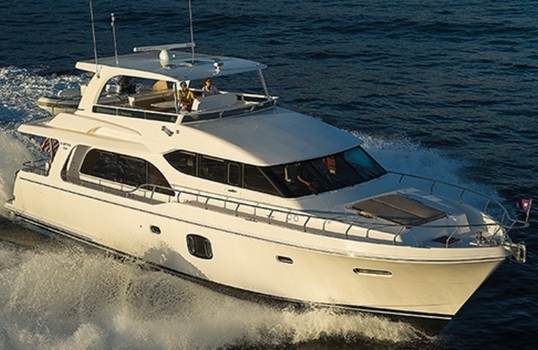 Targa 27.2 follows the same concept as the rest of the range with its walk-around, its flybridge and its sliding doors. When it comes to the design and functionality Targa 27.2 follows the same style as the latest Targa models. The pilothouse is more spacious in both width and length giving an increased level of comfort with four spacious berths in the aft cabin and a standard toilet in front of the pilothouse. The Botnia Targa 27.2 will be powered by a stern drive propulsion, with power options starting from a standard single Volvo 330hp and going up a 400hp engine option. As it is obvious the Botnia 27.2 keeps the legendary hull characteristics which has made the 27 model such a success in over twenty years of production and a total of four hundred units delivered. In the fall of 2017 Wajer yachts launched its new 55 flagship model. Designed by Sinot with naval architecture by Vripack the Wajer 55 impresses for its innovative features such as the push button fender system, automated bimini, dual purpose swim-platform which also becomes a gangway, hydraulic operated anchor, adjustable console and movable cockpit floor, triple engines IPS pod installation, and spacious garage with space for a jet rib. For the accommodation the Wajer 55 will feature a lower deck interior with four berths, two single berths at midships, forward double berth, an L-shaped galley to port side, and shower head to starboard. The living area is all concentrated on the main deck with two sun-pads and L-shaped settee on each side, and four forward facing settees with helm station to starboard. The Wajer 55 and its triple Volvo 435hp engines and IPS pod propulsion set up delivers a max speed of 38 knots, and a cruise of 28, while a 25 knots performance delivers a 130 liter per hour consumption or 5.2 liter per mile which is actually not bad for a 20 ton sport yacht. New order for the Maxi Dolphin boatyard in Erbusco, Brescia for a 48 feet tender boat designed by Nauta Yachts currently being built and completed at the boatyard. An enrichment and enhancement of the boatyard’s experience in the field of motor yachts, the idea behind the Maxi Dolphin 48 Tender project is a fast support sport cruiser for a super yacht of major dimensions. 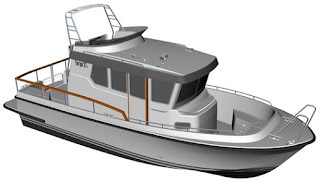 The 48 Tender will feature a soft and continuous fender line for protection, facilitating the docking at the mother boat. The exterior design has been inspired by an aesthetic appeal recalling work boats. The tender actually appears to be a patrol boat, yet is distinguished by elegant lines that are in perfect harmony with the essence of a virtually navy and likewise handy boat. The cockpit has been designed for living the sea with two large stern sun decks, and two adjoining symmetrically arranged living spaces with tables in the hard-top protected area, which can be lowered to create additional sun-protected relaxing spaces. This area is directly connected to the efficient and cutting-edge bridge with front glazing enabling high visibility even in case of night-time navigation. The below-deck layout provides a comfortable master cabin at bow with en-suite bathroom, a kitchen as well as a sailor guest cabin with private services. The both elegant and cosy style has been enhanced by the use of distinctive materials such as resin-bonded laminated linen for the ceilings, and for kitchen and bath tops. Power will come from twin 600hp Cummins engines with Kamewa water-jets propulsion. Design predicted top speed is of 38 knots. Amer Yachts from Sanremo Liguria region in Italy presents its new World wide web showroom. Founded by Fernando Amerio, the life of Amer yachts starts in the early sixties. In this period Fernando starts a boat service company and in 1973 this develops to the Permare Nautical Center. In 1988 Amerio makes an important step taking over the sixties founded Mediterraneo ship yard facility, located on the outskirts of San Remo yachting harbour. Amerio renews Mediterraneo completely and to it's strong facilities adds a new one hundred tons travel lift. 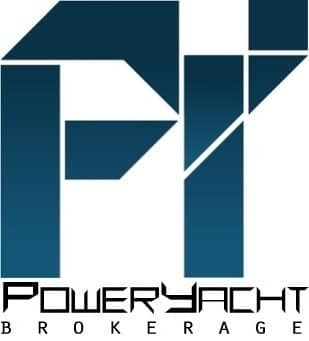 In the nineties Permare starts to build motor yachts under contract from Raffaelli from the Adricatic coast. Its the time of the Raffaelli AMC series of 18, 20, 22 and 26 meters of which Permare Amer will build a total of 52 units. The first Amer unit will be the 24 which was received with huge success and is to be followed a few laters by the 86 best seller of the company; designed by Profilodesign, and Andrea Bacigalupo for hull. Currently the Amer line up features four super yacht models which start with the 94, 100, Cento Quad the quadruple IPS version of the 100 launched in 2016, the 116 and go up to a still in project 136. Amer new website is available in Italian and English language and takes you around with the following buttons; Home, Yacht, Design, Company, Brokerage, News and Events, Press Room, and Contact. Amer also features its social media pages; Facebook, Tweeter, Youtube, Pinterest, Linkedin, and Tumblr with links located at the top left corner of the page. So this is some interesting news for Azimut Magellano line who has been a game changer for the Italian boat builder and nautical industry alike, and with this 25 metri project enters super yacht 24 meters plus territory and also becomes part of the Grande collection, which currently features three models from 27 to 35 meters. The first Magellano 74 launched in 2010 was a game changer to the boating industry introducing what is called today the modern Mediterranean explorer yacht to the World. So far Azimut for the 25 metri Magellano has only gave this rendering showing the main deck saloon and next to nothing technical details. What we know is that Vincenzo de Cotiis from Milan will be taking care of the interior. This will be Vincenzo de Cotiis first yacht having made twenty years of career designing boutique, hotels, private homes, and restaurants. The launch boat fashion is certainly in full swing in recent years with offers in the segment becoming bigger and more versatile then ever. Chris-Craft new 38 Launch line flagship is one of those versatile offers, a sport cruiser which can feel at ease as a day boat, a Villa or a super yacht tender, and or as a weekender thanks to its lower deck five berth accommodation. Versatility is also in in the power options available for the Chris-Craft 38 Launch being offered in a total of ten choices, from petrol to diesel, and propulsion sets ups of twin stern-drives and the always growing in popularity outboards which here is also available in a triple Yamaha engine high performance option. 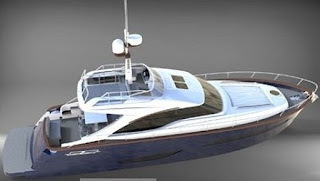 Here at PowerYacht we like what Austin Parker and its designer Fulvio de Simoni have done in recent years and while the inspiration of the hull lines goes to the Down East lobster boat, inside and on deck these are more about an Italian cruiser and yacht then anything else. For 2018 Austin Parker is currently finalizing the 48 Sportfly, a flybridge version of the 48 Sundeck which was presented in Cannes 2017. The Austin Parker AP 48 Sportfly will feature a more flybridge deck with helm station to port side, a forward facing settee to starboard, and a sun-pad taking a big percentage of the space available. For those that don't know that is what most sub fifteen meter Italian flybridge cruisers featured up top a couple of decades ago. For the remaining the AP 48 Sportfly should be very similar if not identical to the Sundeck version which features a lower deck of three double cabins. Power is from twin Cummins 550hp with shaft line propulsion which give a top of 28 knots. During the fall of 2017 Itama added the S designation to the 45 model. S meaning for Sporty and that for more powerful Cummins engines of 550hp versus the 480hp of the previous standard model. These more powerful engines add the 45 S with a two knots performance now reaching top speeds up to 35 knots. For the remaining the Itama 45 S is entirely the same model as the 45, with the same main deck that works so well in the Mediterranean Summer for an aft sun-pad and C-shaped dinette, and an interior for a two or single cabin choice. With the current center console mania increasing in success and size Blue Game should be a builder to grow in the coming years. Founded in 2002 Blue Game was and still is ahead of its time, and the launch of Luja, the prototype model launched in year 2000 it showed the road for what an SUV yacht should be. For the fall of 2018 Blue Game is updating its model range, starting with the BG62 what is an evolution of the 60 unit launched in 2009. The new BG62 versus the 60 will feature an interior redesign and exterior restyling by Zuccon, hull shape updated by Codega to support the propulsion change from line shaft to Volvo IPS pod drives. Restyled by Zuccon the interior of the BG62 shows an interior with a two cabin layout and that for a full beam owners cabins. In between the cabins is a galley and C-shaped settee. The Blue Game BG62 will be powered by twin Volvo 900hp with IPS pod drives allowing for a top speed up to 35 knots and cruise in the region of 30 knots. The building journey of the Casa 38 T-Top continues, with the build of this fully made to order and to a customers request unit now coming into its final details. 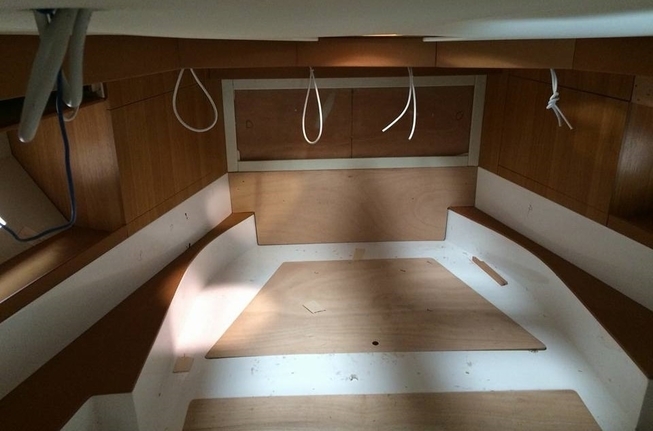 In the above picture we are seeing the finishing touches of the Casa 38 T-Top forward master cabin with the twelve volts cabling and air ducts being completed. Unlike most modern center console interiors who are for the most part finished in fiberglass with a little bit woods added to cabins and cabinet doors, the owner of the Casa 38 T-Top decided to go for a conservative interior fully filled with the warmth of wood and light colored white leather details. Sea Force IX a custom sport fish yacht builder presents its new website. Sea Force IX is founded and still managed by Ron Rookstool, who started his water boating life at fifteen years old, in the North East part of the Atlantic ocean. After 25 years of experience and a rebuild of a Rybovich 37 Captain Ron 'Rook' Rookstool founds Sea Force IX. 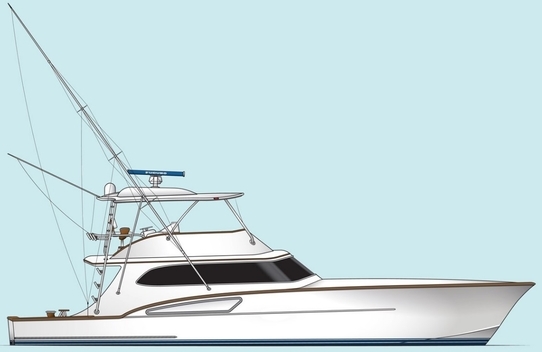 Sea Force IX is currently located in Palmetto, Florida and offers seventeen custom build to order sportfish cruisers and yachts from 41 to 131 feet long divided into four ranges; Performance Sport Fishing Yachts, Luxury Performance Sport Yachts, Performance Sport Outboard, and Luxury Performance Skybridge Sport Yachts. Sea Force IX new website takes you around with the following buttons; Home, About Us, News, The Fleet, Commercial Division, Services, Galley, and Contact. Sea Force IX is also on social media with a button on the right corner of the screen taking you to its Facebook page. 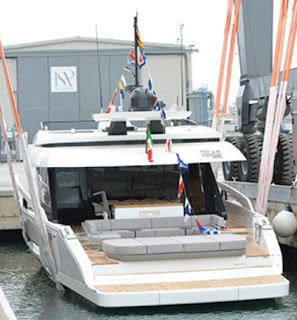 Cerri Cantieri Navali shipyard based in Avenza, presented at the Versilia Yachting Rendez Vous held in Viareggio from 10th to 13th May the latest project signed Stefano Vafiadis; the Dom 123. First of a new line of boats called Dom from latin Domus, which translates to home, this 37 meters, designed by Stefano Vafiadis is born to cruise both with comfort and style. The design was driven by the desires and needs of a modern and young yacht owner, thinking also about lifestyle. The Dom 123 is characterized by an aluminum semi-displacement hull and can reach a maximum speed of 21 knots and a cruising speed of 18 knots, thanks to two MTU engines of 2600hp each. The hull, tested at the Brodarsky Institute of Zagreb, presents a forward bulb designed to optimize the performance of navigability and efficiency at a 12 knots economical cruising speed, ensuring a range of 3000 nautical miles. In addition, the chosen beam of 8.70 m allows large internal volumes, providing at the same time high stability in all sea conditions. The layout of the super yacht can accommodate four or five cabins in the lower deck. In the latter case, the main deck is dedicated to the owner's cabin only, offering a ten or twelve guests option. The four cabins layout hosts two wide body VIP cabins on the aft side and the fore side of the compartment and two convertible twins (or doubles) amidship. The owner's cabin is on the main deck and has two wonderful side windows (floor to ceiling) that ensure spectacular sea views and plenty of light inside the accommodation. The interiors are very spacious as well. The two salons offer lot of space: the one on the main deck is more formal and hosts a dining room for ten people, twelve if requested, with a central living room arrangement. On the upper deck we find a sky lounge that can become a cinema room. Going outside through the sliding windows that can open completely, there is a spectacular and panoramic external dining area with a round table, always available for 10/12 guests. The service is ensured by full size pantries on the main and upper deck, plus a professional galley on the main deck. The captain’s cabin is on the upper deck while the rest of the crew is located on the lower deck, where there is also a crew mess and a laundry. The external spaces are vast and cozy, designed both for parties or relax. The aft peak on the main deck offers a nice seating area with table, ideal for informal dining. The external dining area is on the upper deck; here you can find a comfortable conversation area with a C-shaped sofa perfect to enjoy the view. The flybridge is very large and offers a modern squared jacuzzi with details and chromed railings, served by a central staircase. The tender garage is functional and separated from the beach club. The beach club has a very wide platform that covers the complete height of the stern when closed, offering while horizontal, a very large livable area and a great opening. Everything is perfectly equipped and studied to be on the water in full comfort, and to enjoy the most of the sea. The length of the tender is six meters and in the foredeck area we find further a jet ski with a crane and space for toys. Vincenzo Catarsi died on 14 June at the hospital in Livorno in the palliative care department, assisted by his daughter Federica who worked to the last moment. All the citizens of Vada, Province of Livorno in Italy but also many other people who knew him mourn his death because Vincenzo was a well known character for the various entrepreneurial activities, for the talent and for the good nature and ironic character at the same time. From June 5 last year he fought against a disease that did not escape him. Catarsi had gained great popularity especially for two events that marked his life. The first was dated in the fifties when he created and began to conduct the "La Barcaccina" dancing restaurant on the beach of Vada. Together with his father Romolo and his uncles, Autilio and Bruno, all expert fishermen, contributed to the great success of this place. The restaurant was booming. After 10 pm the environment was transformed into a ballroom. The famous "Les Optimistes" group from Livorno came up on the podium and there were frequent evenings where the best jazz musicians could be heard, as Chet Baker with his fantastic trumpet, the duo Gianni Basso (saxophone) and Oscar Valdambrini (trumpet), the pianist Romano Mussolini and the trumpet player Nini Rosso, known for his virtuosity. The performances of artists such as the singers Nicola Arigliano, Achille Togliani, Tony Renis, Joe Sentieri and the unsurpassed imitator Alighiero Noschese are also very applauded. In those years "La Barcaccina" was able to compete even with the great clubs of the Versilia. Many customers who attended the meeting were really famous as Bice Valori and Paolo Panelli often accompanied by Flora Carabella and Marcello Mastroianni. There was also a young Ermanno Olmi destined to become one of the greatest directors of Italian cinema. But since Vincenzo had not forgotten his family's maritime origins, the second major event of his life was linked to the creation, planning and construction of the "Calafuria" which was born in 1971. This seven meter long boat, presented at the Genoa Boat Show, conquered an important place in the difficult world of the national shipbuilding industry and beyond. In fact, the "Calafuria" became a historical mark in the rise of the important nautical names of the period. To this first hull followed many others different for the length and for the use to which they were destined. Some were "Calafuria" open, other cabins and even semi-cabins. Vincenzo, born in 1932, after the high school he enrolled at the faculty of engineering. Catarsi had ceased his activity by retiring in 2010. Vincenzo Catarsi leaves his daughter Federica, and his wife Carla. Cantiere delle Marche is proud to announce the successful launching of the Acciaio 105, christened M/Y Gatto on the 17th of May 2018. Her delivery is planned for later in the summer. Responsible for the exterior design as well as naval architecture is Hydro Tec who has given Acciaio 105 a bold yet contemporary exterior accompanied with traditional fresh interior style by Francesco Guida Design. With this model Cantiere delle Marche proves, once more, its flexibility and knowledge of the market. Acciaio 105 is also a testimony to the excellent cooperation between all parts involved in her construction. Ultimately, CdM's team, excellent craftsmen included, proved the yard's capacity to meet an exacting brief on time. Having experienced the behavior of the Darwin 107 Storm into a real storm wind blowing at 40 knots and more than 3-metre swells the owner was attracted by the benefits of a robust and reliable explorer hull, yet asked both yard and designers for softer and more contemporary lines. Thanks to her strong yet gentle lines, Acciaio 105 crosses indeed the ineffable border between sturdiness and robustness. Acciaio 105's design combines beautiful lines with a contemporary flair. Private exterior decks create the perfect retreat for the guests while generous interior spaces host both social and private areas for ten guests pampered by a crew of six. The interiors designed by Francesco Guida are the result of a true collaboration among the designer, the owner and the yard as they negotiated around structural constraints to achieve the best possible result. By boldly mixing dark and bright colours and cleverly contrasting materials, Guida breathed life into M/Y Gatto's interiors. With a transatlantic range of 4500 nm at the economic speed of 10 knots, top speed is 13 knots, which is particularly outstanding given that it is achieved with just two Caterpillar engines 670hp each relatively small engines for a yacht of her size and displacement. Thanks to her well-engineered steel hull with bulbous bow, Acciaio 105 will ensure a smooth path through water, and will be the perfect home away from home in all sea conditions. Acciaio 105's Owner, who is extremely pleased with the outcome, is looking forward to enjoying his yacht on her maiden voyage. The new Nimbus Weekender 9 is a nine meter weekend boat for social activities with overnight accommodation for two three persons. The W9 is loaded with Nimbus DNA and design elements from historical models of the Swedish boat builder. The similarities with the iconic 26 DC are evident while there are many goodies from 21 DC, 32 DC, Max II, R series and the 305 Drophead. Nimbus has chosen to meticulously improve design, functionality, safety and comfort for all on board. Weekender 9 can be fitted with inboard or outboard engine. 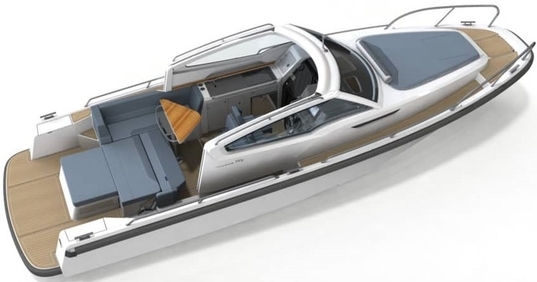 The inboard version shown above is to follow the outboard variants as presented in the fall of 2017, and is powered by single Volvo diesel up to 220hp and or petrol gas till 350hp. 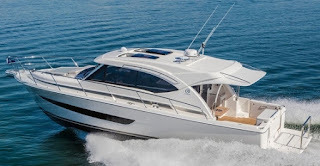 The new Hampton 650 has garnered the attention of those who have admired the company’s pilothouse cruiser series, but found the 700 and retired 680 with a bit more yacht than they needed and wanted a little more room that the 590 model. 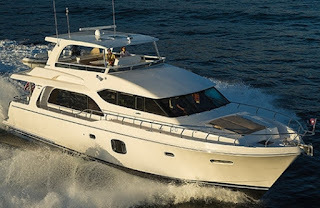 The Hampton 650 with all its great features such as the covered side and aft decks, the full beam owner’s suite and the spectacular open salon and pilothouse arrangement combine to make it a great destination place where family and friends can join together for some great cruising and relaxation. During the Versilia Yachting Festival, Tornado yachts sold the first unit of the Tornado 50 S. This Tornado project is the new edition and a further development of the original 50 as launched in 2010 and designed by Francesco Guida. Similar in looks to the previous version the 50 S will feature some important differences most of which will be the higher position windscreen, teak inserts on the main deck with a protective side walk passageway. Since the seventies Tornado has based its success on inspiring itself to the original American sport cruiser, with huge influence by the Magnum models of the period. Australia's most awarded luxury motor yacht builder, Riviera, has World Premiered the company’s first new under forty feet model in nearly a decade, the sporty and adventurous 395 SUV. Unveiled at the opening of the Sanctuary Cove International Boat Show, the 395 SUV displays a contemporary elegance, from her entirely new hull and deck design with feature hull windows to European-inspired fabrics and cabinetry throughout. The new 395 SUV offers two generous staterooms and a large bathroom on the accommodation lower deck, a spacious saloon and an open cockpit perfectly designed for relaxing and entertaining or for a raft of water sports. Riviera's 395 SUV comes powered with twin Volvo 370hp engines and forward looking dual propeller IPS pod drive units. Codecasa are delighted to announce that they are building a new 55 meters, Hull C123, with delivery scheduled for Summer 2020. Codecasa C123 will be a four decks fully custom and displacement Yacht with high technical and quality standards. The yacht exteriors are featured by clean and elegant lines, according to the Codecasa tradition and the its renowned family feeling. The Interiors are comfortable and bright, thanks to the natural light coming from the big windows featured in each deck. The technical project has been totally developed by the Codecasa in-house team, while the interiors will be designed by the owner’s interior designer in co-operation with the yard style department. Codecasa 55 C123 is to be powered by twin Caterpillar 2365hp engines which will give a maximum speed of seventeen knots at light displacement. Wider has just launched its largest build to date with the launching of the new and much awaited 165. The new Wider 165 is a design of Fulvio de Simoni representing fine style, practicality and ingenuity. The Wider165 is a no-compromise two deck and a half super yacht that features advanced multi-functional systems, user-friendly technology, diesel-electric propulsion, and an enhanced relationship with the sea thanks to the spacious beach club area, side platforms, balcony, and an interior seawater swimming pool. Constructed entirely in aluminium, the elegant silhouette has been designed to enhance and significantly increase interior volumes compared to other fifty meter super yachts. Wider 165 has been launched in May 2018 and is ready for delivery in summer. Sunreef Yachts officially unveils the 80 Power the universal multihull yacht for long cruises in ultimate comfort. Taking luxury and seaworthiness to a new dimension, this dynamic and elegant craft enters the Sunreef Yachts range, redefining the authentic power catamaran design. With a bold, contemporary hull styling, the 80 Sunreef Power incorporates classic stainless steel port-lights, teak sole decks, high bulwarks and subtle ambiance lighting. A massive garage combined with an aft platform allows the 80 Sunreef Power to take a tender, plus numerous water toys and jet-ski anywhere she goes. Easily accessed from the saloon, the yacht’s full-beam bow terrace is a vast, soothing retreat with amazing amounts of space for sunning and lounging. The 80 Sunreef Power’s immense flybridge offers enough breadth to house a spa pool, a wet bar and generous seating all around. With unlimited options for customization, the shipyard’s new power catamaran is the perfect pick for the creative yachtsmen. The Sunreef 80 Power is powered with twin engines from twin 575hp up to 1200hp engines. Fuel capacity is also an option with choices of capacity from two by 5000 to 8000 liters fuel capacity. 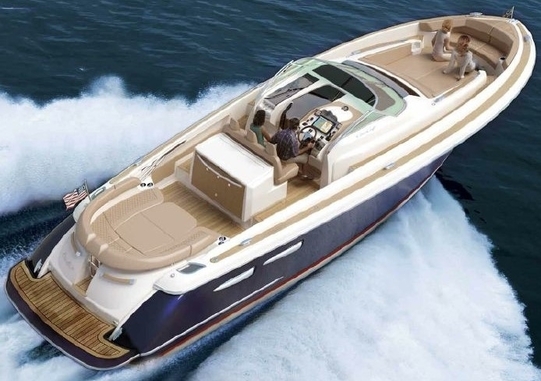 Boasting all the latest innovations of the brand, this sporty version of the 460 rightly named Prestige 460 S integrates the concept that is so dear to the French boat builder. With her remarkable sporty look coming from the hands of Italian designer Garroni the Prestige 460 S benefits from an incomparable design, open to the exterior. Adaptable to suit your needs, the large opening sunroof and immense sliding glass door aft can be used to modulate the living space according to usage and weather. The Prestige 460 S allows one to enjoy an enhanced exterior space when fully opened and a more protected living space when closed. It is worth noting the enhanced modular design, featuring the new L-shaped cockpit, which transforms into a very large sundeck. The Prestige 460 S is powered by twin Volvo 370hp or optional 435hp engines with IPS pod drives delivering max speeds up to 33 knots. Down under Clipper Motor Yachts present the baby of the new generation of Hudson Bay pleasure cruisers, the 350 which is currently in-build at the company's yard in China and due to hit Australian shores before Christmas. 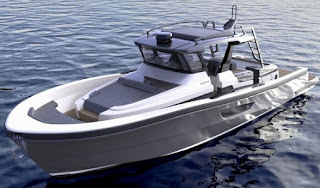 Clipper Motor Yachts General Manager, Brett Thurley, said the sleek down East lobster boat inspired sedan cruiser is superbly designed with a modern flair. The first Hudson Bay 350 will be powered by a Volvo 260hp shaft drive diesel engine giving her a cruise speed of approximately 14 knots. The Hudson Bay 350 will have a lower deck layout with an owner's cabin with a queen bed forward, hanging lockers and extra storage. A clever bathroom design allows for a separate stand up shower with fixed screen door and separate vanity cabin to starboard while a large electric toilet , sink and vanity cabin is to port. The main deck will feature the galley located on the starboard side of the saloon along with a highly functional double, forward facing cruising seat which is located at the front of the saloon opposite the helm. The galley features a square stainless steel sink, Corian counter top, and a two eye cooker, Webasto Inox refrigeration and freezer and microwave. The enclosed saloon area is all on one level with the cockpit for ease of entertaining and wide opening saloon doors see the indoors and the outdoors seamlessly merged. An electric sunroof above the saloon and hatch above the owner's cabin provide ample ventilation. Extra as extraordinary, the first born of the range is an explorer yacht with unique modern features. Unusual lines, smaller dimensions, an innovative concept of use: ISA Yachts 76 Extra is designed to meet the needs of those who want to get closer to the world of yachting, enjoying full contact with nature and in a spirit of full conviviality with their guests or family. Designed by Francesco Guida, the 24 meters yacht has been launched in Ancona and then delivered to her owner at the end of April. Extra 76, with her maximum beam of 6,8 meters, sets a record in the yacht segment in terms of cockpit and saloon volumes, giving her guests the chance to live in close contact with nature and creating a direct feeling with the sea both in navigation and at anchor. The big Research and Development effort has been strongly dedicated to the environment as well. Extra 76 has been designed to offer an unforgettable experience in terms of comfortable navigation, a feeling that is further enhanced in the interior spaces. On the main deck the galley is positioned to aft, with access to the dining area in the cockpit through the big central glass panel, which slides down vertically to unite the two areas. This layout is designed to encourage socializing, and also provides an alternative solution to dine indoors, in the contemporary and spacious saloon, furnished with large sofas and an extending table. Below deck, the full-beam owner’s cabin features a special entrance area for privacy sake and includes an en-suite bathroom with twin basins, a shower and a separate bath tub, as well as a convenient walk-in closet. The continuity between the bedroom and the basin area enhances the felling of comfort of the whole suite. The three guest cabins include two twins and a double VIP room forward, with the closets and shielding conveniently placed in order to perfectly insulate these spaces from the crew area. The original look expresses the distinctive character and unique personality of Extra 76: the play of contrasts on the yacht’s sides between light-colored fiberglass and dark glazing recalls at first glance the lines of a traditional sport yacht seen from a contemporary perspective. The large glazed surfaces are combined like part of a crystal sphere, and offer plenty of natural light and unprecedented room to the elegant living areas. The design of the layout grants top livability through all the areas: for instance, the exceptional cockpit/beach club of over 50 square meters, truly unique for even larger yachts, which allows guests to enjoy the contact with the sea in absolute comfort. The cockpit delivers unusual volumes, on three levels dropping down to the water. The fly deck, whose shape perfectly complements the sinuous look of Extra 76, offers a second helm station, an area for socializing with wet bar and a C-shaped sofa, and a huge sun lounging pad. It's the best area to enjoy a long cruise or to dine together, from a privileged point of view. The propulsion for ISA Yachts 76 Extra relies on two efficient Volvo 800hp engines with IPS forward looking pod propulsion that take the boat to a maximum speed of 21 knots and provide a range of over 700 nautical miles at cruising speed. Living the sea in harmony with nature also means respect for the environment. 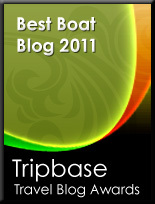 The meticulous design process focused on the development of a hull with minimum water resistance. This feature, and the big capacity of fuel tanks and generators mean that guests of Extra 76 can embark on long cruises with a view to maximum environmental sustainability. The glazed surfaces in the saloon incorporate photo-voltaic cells to generate clean power. This is used to recharge the service batteries, so that equipment like lights and appliances can be used without turning on the generators at anchor and leave the soundtrack on nature. The care taken over reducing environmental impact, low consumption and big, well-lit spaces available on board make Extra 76 an unparalleled choice for owners who want to enjoy a relaxing cruise to the full, in total harmony with the sea and attentive to 'green' solutions, in one word: eco-friendly. ISA Yachts 76 Extra premiered at the Versilia Yachting Rendez-Vous in May.